Pop a half a cup of popcorn kernels. While they are popping, place 1/4 cup of coconut oil in a sealable jar and heat in the microwave for about a minute until it is in a liquid state. (Some climates are hot enough that it will always be in a liquid state.) Add the sriracha to the jar, seal it and shake vigorously. Drizzle over popped popcorn. Salt finished popcorn to taste. Cut off the corn kernels; set aside. Combine the cobs, 1/2 cup scallions, 1 tablespoon ginger, the garlic, peppercorns and 5 cups water in a pot. Smash the lemongrass, if using, and add to the pot. Bring to a boil, then simmer for 25 to 30 minutes. About 10 minutes before the broth is finished, melt the butter over medium-high heat in a separate pot. Season with salt. Add the remaining 1 tablespoon ginger and the jalapeno; cook 1 minute. Add the corn kernels; cook until the vegetables are just tender, 3 to 4 minutes. Strain the broth, pressing out as much liquid as possible; discard the solids. Add 2 cups of the strained broth to the corn; bring to a boil, cover and simmer for 10 minutes. Add the coconut milk, basil and mint; season with salt. Stir until simmering. Remove from the heat and add the cilantro and lime juice. 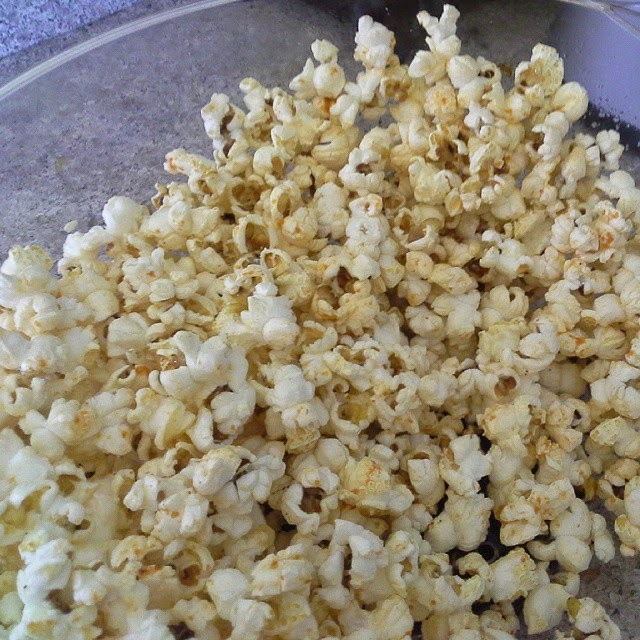 Top with the sriracha popcorn and serve with lime wedges.